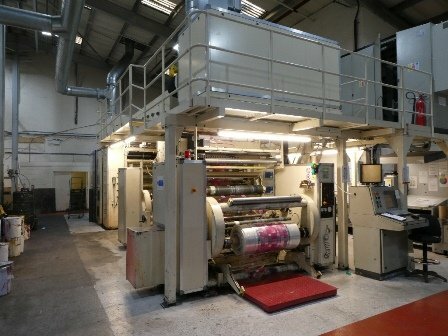 If you’re looking to buy a used flexographic press, we’re here to offer specialist advice to ensure you make the best decision for your business. Flexographic press (flexo press) machines are widely used in the converting industry for printing on a variety of different materials including plastic, foil, films, paper, laminates, metallised materials, and other materials used in packaging. Typical products include retail and shopping bags, food and hygiene bags, sacks, flexible films, and self-adhesive labels. The process involves polymer plates fixed to a sleeve or cylinder, and uses solvent and/or water-based inks to enable faster drying, faster production, and lower costs. Flexo press machines produce large rolls of material that are then slit down to their finished size on slitter rewinder machines. Manufacturers include Bobst, Fischer & Krecke, F&K, Windmoeller & Hoelscher, W&H, Comexi, Heaford, Uteco, Schiavi, and PCMC. Search our used ink pumps, used gearless presses, used 8 colour presses, used 10 colour presses, used label presses, used stack presses, used mounter proofers, used geared presses, used CI presses, and used abatement or RTO equipment, below. Not here to buy? Looking to sell? If you’d like to sell a used flexographic press, simply call +44 1204 300495 or use our enquiry form to have your machine listed here for free.